Magnus. He’s a complex character, he’s fun and he’s a total badass warlock! What is your favorite Jace quote from the books? Who is the sexiest shadow hunter in the series? If you could have any shadow hunter last name, what would it be? Lightwood. Because Lindsey Lightwood just sounds awesome! Who is your favorite actor in the tv show? Matthew Daddario. He’s amazing. Seconded by Alberto Rosende as Simon. Who is your favorite actress in the tv show? Emeraude Toubia as Isabelle. Because she’s badass! Also, I’m not a big fan of Kat McNamara as Clary (sorry!). I prefer Lilly Collins as Clary in the movie. Would you rather hear Jace play piano, play video games with Simon, Jem play violin, or read a book with Will? Easy. Read books with Will. Because books. And Will. If you could have one rune from the book, what would it be? How about the stealth rune? I’m pretty clumsy so it would be nice to be stealthy like a ninja (or shadowhunter) for once. What downworlder would you most likely be? The Mortal Instruments or THe Infernal Devices? 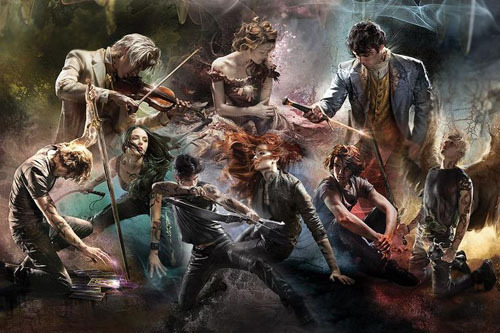 The Infernal Devices. Because while I loved TMI, I ADORED TID that much more. I love the characters, I love the romance, I love the setting, I just love everything about them! Who is the most hated character for you in the series? Sebastian Morgenstern. He was a good and creepy villain in the first TMI trilogy, but in the second one he was just too much. I kind of pictured him with a mustache so he could be twirling it all the time and also saying ‘Excellent’ in a Mr. Burns voice all the time. Spend a day with any character, who would it be? Simon, because he’s hilarious and it would be so much fun to hang out with him. Clockwork Princess. One of the best endings to a trilogy ever. What did you think about City of Heavenly Fire? I had difficulty getting through it but I did love how it wrapped everything up, while at the same time already setting up The Dark Artifices. I also LOVED all the Infernal Devices references. Reading The Dark Artifices (reading Lady Midnight now!) and waiting for The Last Hours. The ending scene in City of Glass. I loved everybody sitting together and celebrating. That scene just gave me such a big feeling of contentment. Will is great and I love him, but I’m a Jem girl all the way. He’s sweet, kind and romantic, and I fell in love with him from the first page I saw him. What scene/thing are you looking forward to in the Dark Artifacts? All things Parabatai. I’m so intrigued by this concept and I loved the relationship between Jace and Alec and also Will and Jem so I can’t wait to see the relationship between Emma and Julian. If you could say one thing to Cassie, what would you say? If you can play one character in TMI show, who would it be? If they ever introduce Tessa to the Shadowhunters tv show, I would love to play her!